Last year marked the 40th anniversary of Paul Ehrlich's The Population Bomb, one of the two most influential environmentalist books of the 1960s with Rachel Carson's Silent Spring (1962). Ehrlich's tract is now best remembered for its inflammatory statements that "the battle to feed all of humanity is over" and that "hundreds of millions of people" were about to starve to death in spite of any large-scale attempts to boost agricultural production. To Ehrlich's supporters, he only got his timing wrong. To his critics, he misunderstood the inherent capacity of market economies to tap into creative human brains and to continually deliver innovative solutions to pressing problems. What both Ehrlich's supporters and detractors fail to observe is how unoriginal his rhetoric was. Of course, the English clergyman and economist Thomas R. Malthus had articulated similar arguments in his "Essay on the Principle of Population" (1798), but so did many other writers in the interim period. By a strange coincidence, The Population Bomb was published the year of the death of William Vogt (1902-1968), the man who had introduced Paul Ehrlich to the Malthusian worldview. While largely forgotten today, Vogt was the author of the Road to Survival (1948), a book that reached between 20 and 30 million individuals and was the biggest environmental best-seller of all time until the publication of Silent Spring. Vogt belonged to a large group of individuals, many of whom had previously been active in the eugenics movement, who witnessed with horror the diffusion of new agricultural techniques, medicines, and pesticides to less advanced regions of the world. These apparently beneficial technologies, they argued, would soon result in rapid population growth, resource depletion, environmental destruction, and ultimately social collapse. To spread their message more effectively, some propagandists began to use catchwords such as "population bomb," "P-bomb" and "population explosion." 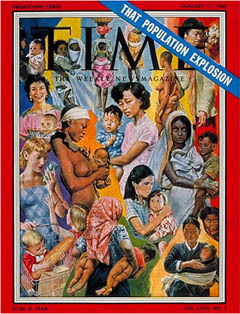 This rhetoric became so widespread that it even graced the cover of Time magazine in 1960. The importance of population control activists in paving the way for modern environmentalism is now downplayed in favor of causes such as the search for better environmental amenities (clear rivers, clean air, and more green spaces), pesticide use, nuclear weapons, and the rise of ecological science. And yet, the influence of post-war "Neo-Malthusian ecologists" like Vogt cannot be underestimated. Vogt's main thesis was expressed by the influential financier and political advisor Bernard Baruch in his foreword to Road to Survival: "Because of the great abundance of the earth's resources, we have taken them for granted. But now, over most of the globe... we are face to face with a serious depletion of 'resource capital.' More than one country is already bankrupt." In short, mankind had "backed itself into an ecological trap" while, figuratively speaking, living on "promissory notes." All over the world the notes were "falling due" and payment could not be postponed. Fortunately, there was still an option between "payment and utterly disastrous bankruptcy on a world scale," but it implied adapting to "the imperatives imposed by the limited resources of the environment." While problems were numerous, their ultimate cause was population growth. According to Vogt, rich countries like the United States should not subsidize the "unchecked spawning" of the inhabitants of poor countries like India and China until they had adopted a rational population policy. Furthermore, a high death rate could be considered "one of the greatest national assets" of poor economies. Vogt thought pests like tsetse flies and malaria carrying mosquitoes should be thought of as "blessings in disguise" and as a "protector of important resources." Much damage had also historically been done through the four fundamental tools of modern culture: fire, the plough, the axe and the firearm. Despite short-term benefits, each of these had resulted in "despoiled forests, erosion, wildlife extermination, overgrazing, and the dropping of water tables" and the consequent reduction of productivity in "some of the most fertile and productive regions of the earth" to levels almost comparable to those observed in the Gobi desert or the Siberian tundra. Recent technological developments only aggravated these trends. "The importance of population control activists in paving the way for modern environmentalism is now downplayed in favor of causes such as the search for better environmental amenities (clear rivers, clean air, and more green spaces), pesticide use, nuclear weapons, and the rise of ecological science." Vogt's remedies were straightforward. He argued that if political, economic, educational, and other efforts were indispensable, they would only succeed if "population control and conservation [were] included." Many reviewers lavished praise on Vogt's contribution, but a few were critical. One of its most damning condemnations was penned by a Time anonymous reviewer who questioned the political implications of a Neo-Malthusian stance. After all, if even rich nations had too few resources to keep their populations passably well fed, then what should be done if not go out, conquer, and clear other lands of their populations? Hadn't Germany, a country that had managed to "stretch" the sandy acres of the Prussian plain through innovative farming practices and highly skilled industry, already gone to war twice because of the unwarranted prevalence of the "slice-of-cake [that can't be grown] philosophy" among its people? Arguing that an acre of soil is limited in terms of its productive capacity ignored the fact that humans were capable of improving it. Indeed, only individuals who had turned their back on progress could accept the notion that they would have to adapt to soil patterns for survival. According to the Time reviewer, Vogt's outlook on human reproduction was also contradicted by the available data, especially his stance that, as long as food is available, humans would reproduce like fruit flies. To the contrary, evidence showed that richer people were having fewer children despite their access to a more abundant food supply. If Vogt's argument was valid, industrialization should have triggered an increasing birth rate. But this could only be observed in the early stages of the process, whereas a steady decrease was observed afterward. In the end, the reviewer wrote, "real scientists" could only find a few iota of truth in Vogt's "reckless appeals to emotion." This static philosophy, however, gave comfort to the type of state planner who believed that there were only so many resources available and that whatever was available needed to be strictly controlled. Soon afterwards, the University of Delaware geographer Earl Parker Hanson published New Worlds Emerging, which he described as a rebuttal to Vogt and other "Jeremiahs of geography, sociology and economics." Denouncing the hysteria into which the modern world was "being stampeded… by the dreadful word erosion" and the resurgence of the Malthusian doctrine, Hanson had no patience for the notions that natural resources should be left conserved for future use rather than developed wisely and constantly expanded through innovative technologies, that people should be thought of as "liabilities" rather than "assets;" or that a region would be considered over-populated in terms of a population/space ratio alone without factoring in the potential benefits of economic development and innovation. Finally, the Brazilian physician and geographer Josué de Castro's classic The Geography of Hunger (1952) also served as a rebuttal to Vogt whom he accused of merely reflecting "the mean and egotistical sentiments of people living well, terrified by the disquieting presence of those who are living badly." The world, de Castro hoped, would not let itself "be carried away by such defeatist and disintegrative conceptions" because they could only "point the way to death, to revolution and to war-the road to perdition." Many claims made by Vogt in his Road to Survival had already been discredited by the time Paul Ehrlich published his Population Bomb. Vogt, for example, believed that Mexico did not possess more than a third of the land required to provide its inhabitants with a reasonable diet; that its arable land was being washed into the sea; and that the country was becoming steadily poorer due to population growth. In the following years, however, significant scientific advances in plant genetics and production methods completely reversed the situation. For instance, the work of agronomist Norman Borlaug and his team on the development of semi-dwarf, high-yield and disease-resistant wheat varieties resulted in the 1963 Mexican wheat crop being six times larger than in 1944. Soon afterwards, Mexico became a wheat exporting country. A few years later this know-how was transferred to Pakistan and India where it similarly helped to diffuse the local "population bombs" and earned Borlaug the nickname of "Father of the Green Revolution." Despite innumerable agricultural, environmental, and public health advances over the last few decades, the emotional tone and alarmist rhetoric of authors such as William Vogt and Paul Ehrlich remains pervasive among today's environmentalist writers. Some historical perspective on the history of eco-catastrophism, however, can provide a useful antidote to current doomsday rhetoric. * Article first published in the PERC Reports: Volume 27, No.3, September 2009. • This essay is adapted from an essay by Pierre Desrochers and Christine Hoffbauer, "The Post War Intellectual Roots of the Population Bomb-Fairfield Osborn's Our Plundered Planet and William Vogt's Road to Survival in Retrospect." This article was published in the Electronic Journal of Sustainable Development, 2009, vol. 3, no. 1, pp. 37-61 and is part of a special issue on "The Population Bomb Four Decades On." • Pierre Desrochers is an associate professor of geography at the University of Toronto and a 2009 PERC Julian Simon Fellow. He can be reached at pierre.desrochers@utoronto.ca.